CD review: "The Best of the Columbia Years: 1943-1952"
Given the popular caricatures of the man, it's sometimes easy to forget what a powerful and influential artist Frank Sinatra is  or how long he's been on the scene. Not too many artists have careers that span from the Dorsey brothers to Bono and U2. Much of what Sinatra recorded during the period represented on this four-CD collection can only be described as dross  but the producers of this set tried to get rid of as much of the musical pabulum as possible. 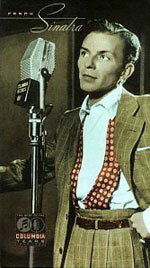 Sinatra didn't have full control over his career at this point of his life, and often had to record substandard material at the behest of the label. And yet, there are some classic Sinatra versions of timeless American classics  songs such as "All of Me," "Someone to Watch Over Me," "I'm a Fool to Want You," "Body and Soul," "I Should Care" and "Stormy Weather" among them. The accompanying liner notes provide nearly 70 pages of photos and text, giving a balanced historical perspective to the music. The folio itself is beautifully bound, a nice complement to the artistry it contains.